Night of a Thousand Smiles! 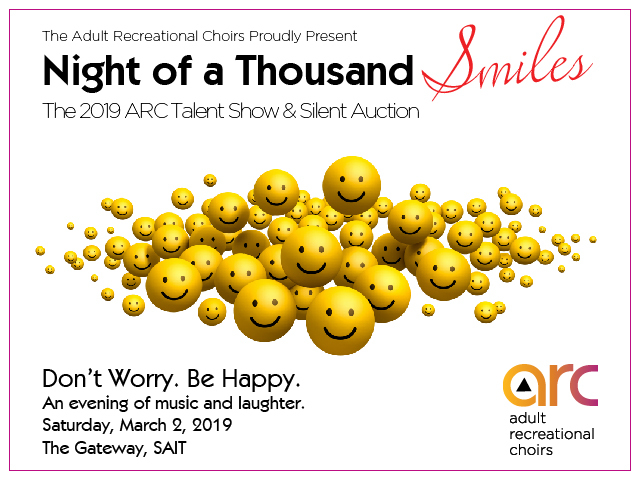 The 2019 ARC Talent Show & Silent Auction! Our annual Talent Show & Silent Auction is a popular showcase of ARC's incredible talent. Offering members across all of our ARC programs the opportunity to "strut their stuff", the Talent Show features solo, duet, trio and ensemble performances. Come and be serenaded by none other than our very own ARC members! We will have some great auction items on display and will once again host the very popular Wine Raffle & 50/50 Raffle! This is an event you won't want to miss. See you there! * This event is rush seating. ARC's Silent Auction helps generate funds necessary to keep our community music programs running and evolving. Proceeds will go directly toward the operations of ARC, enabling us to sustain a quality and affordable program while providing the Calgary community with a nurturing artistic experience like no other of its kind. We gratefully accept donations of merchandise, services or gift certificates. Please contact Stella Arcega for further information.